Pulsair Systems builds powerful mixing and blending equipment for any type of liquid in any size tank to improve tank utilization, promote faster mixing, improve operating efficiency and eliminate in-tank maintenance. Pulsair Systems is the world leader tank mixer supplier and tank mixer manufacturer for large bubble, compressed air liquid mixing and agitation technology. For 35-years, Pulsair has designed and build thousands of custom small tank mixers, large tank mixer systems for a wide variety of mixing applications with thousands of tank mixer installations in more than 40 countries. 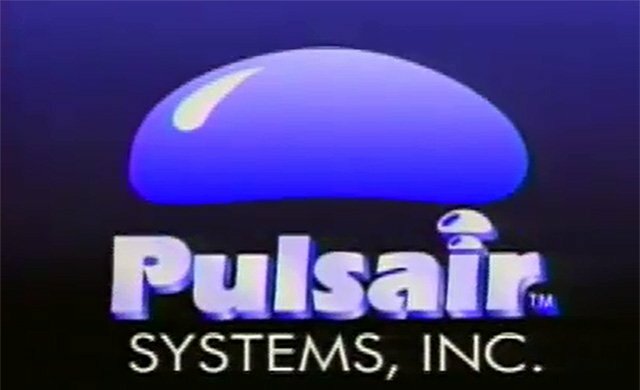 Pulsair invented and patented what is know today at “air mixing”, “pulse air mixing”, “compressed air or gas mixing”, “large bubble mixing” or “big bubble mixing”. Regardless if you are using compressed air or compressed inert gas, Pulsair is the number one choice for small tank mixers, large tank mixers, stainless steel mixing tanks with agitators, IBC tote mixers, 55-gallon drum mixers and rail tank car mixers. Quick, powerful bursts of compressed air or gas are sequentially released at timed intervals at the tank bottom through a series of air delivery pipes connected to flat round disks called accumulator plates that are attached or located on the tank bottom. The powerful burst of compressed is first released laterally across the tank floor to stir up settled solids and sludge before the air is then swept back to the center where the plate is located to form a series of large, flat round air bubbles. Gravity then takes over and the large bubbles pull all the liquids and contents that were first on or near the tank floor up to the surface in a few quick pulses. This powerful mixing technology enables Pulsair’s customers to mix and blend high solid liquids, high viscosity liquids and liquids with a high specific gravity. 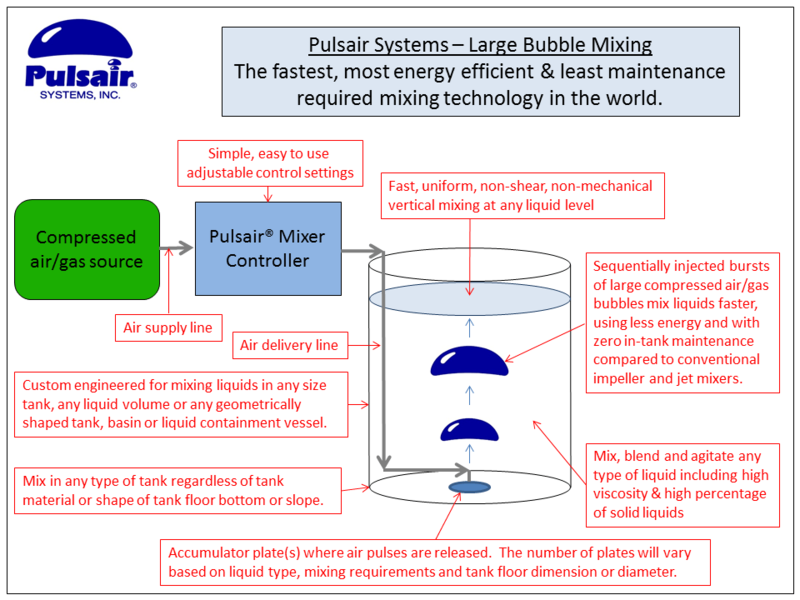 The fast, innovated Pulsair large bubble mixing process translates into high energy efficiency. The liquid will continue to move in the tank after the bubble reaches the surface. Therefore the mixer does not have to run 24/7. Once the air or gas is compressed and then released on the tank floor, no more energy is consumed. This energy savings reduces costs at the customer’s facilities. Depending on the tank mixing application, customers may reduce their mixing energy consumption up to 95%. The Pulsair tank mixing process is extremely fast and efficient. All the contents of the tank the were previously on the bottom of the tank are now at the top of the mixing tank in a few minutes and 100% of the liquids have been completed mixed and agitated. Many customers have reduced their tank mixing and tank blending times by up to 95%. There are zero moving parts inside the mixing tank with Pulsair’s non-mechanical tank mixing process. This features allows the owner to eliminate in-tank maintenance typically associated with traditional mechanical mixers. Pulsair offers a complete line of industrial tank mixers for powerful liquid mixing in any size tank. This efficient, large bubble mixing tank process allows liquids to be quickly mixed. Besides that, Pulsair’s mixing tank systems use less energy and also require less maintenance compared to conventional mixing tank methods. Therefore, this revolutionary, non-shear tank mixing process is excellent for primary liquid blending. And also re-suspending settled solids or re-blending separated liquids and keeping the tank fully mixed and blended. Regardless of your tank geometry, Pulsair can custom engineer the right mixing system that fits your needs. Contact Pulsair today to learn more about this fast, efficient and low maintenance mixing process. 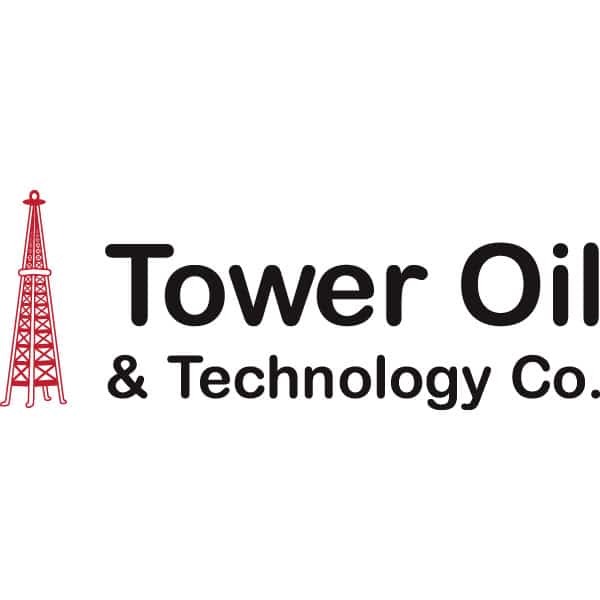 Hugh Wahl, Owner, Tower Oil and Technology Co.